The F/V Destination was bound for St. Paul Island when it sank a few miles northwest of St. George Island. The entire crew — Captain Jeff Hathaway, Larry O’Grady, Charles Glenn Jones, Raymond J. Vincler, Kai Hamik, and Darrik Seibold — was lost. That's the conclusion of a report released last week by federal investigators. The findings shed new light on the loss of the F/V Destination and its six crew members. On Feb. 11, 2017, the Destination was pushing through rough, frigid waters a few miles from St. George Island. Then, in about four minutes, the boat went from carrying 200 crab pots and preparing for opilio season to vanishing without a mayday call. "Whatever happened happened very, very quickly, and there's no one left to tell their story," said spokesperson Chris O'Neil of the National Transportation Safety Board (NTSB). NTSB investigators reviewed the vessel's mechanical history, pored over weather reports, and interviewed almost 50 people to piece together the probable cause of the accident. "The captain's decision to proceed into heavy freezing spray conditions without ensuring the Destination had a margin of stability to withstand that accumulation of ice led to the loss of the vessel," said O'Neil. In better conditions, the boat could have carried the 200 crab pots without a problem. But with gale force winds kicking up freezing spray, the Destination became weighed down by as many as 339,416 pounds of ice. "If you look at that probable cause, yes, this is a preventable accident," said O'Neil. Crew members of the F/V Polar Sea beat ice off their vessel on Feb. 11, the same day the F/V Destination went missing. Both crab boats were traveling near St. George Island. With no survivors to interview, NTSB couldn't determine why the crew didn't beat more ice to mitigate that weight — especially a well-respected crew with more than 70 years of collective fishing experience. "It's very hard to know the mindset, the decision-making process, and what factors were or were not considered," said O'Neil. "But certainly, through the evidence that was collected, we recognized the pressures that are associated with the industry." Investigators found several signs that the crew was feeling the pressure of time. The vessel had gotten a late start on crab after fishing for cod. Its delivery deadline was looming. And a few weeks earlier, a crew member had texted his father, "Oh my god, I haven't slept in days." The strains of commercial fishing are familiar to Daher Jorge. He's captain of the F/V Polar Sea, which was fishing for crab in the same area as the Destination the day it went down. "The whole crew was exhausted," said Jorge. "I was beating ice with my crew." The Polar Sea pulled into port safely after hours spent heaving sledgehammers to break ice. But in an interview weeks later, Jorge said the Destination's sinking was a wake-up call for the entire fleet. "It’s devastating," he said. "They say most accidents happen 10 minutes from home. He was so close to St. Paul. He was at St. George. He could've anchored up there and gotten some ice off the boat. We have no need to rush so much. We're going to catch the crab, so why are we going to push that hard?" In a fishery that's made huge safety strides in the last two decades, U.S. Coast Guard officials say crabbers have taken the sinking to heart. The loss of the Destination marks the fleet's deadliest accident since 2005. This Sunday, Feb. 11 marks the one-year anniversary of the loss of the F/V Destination. Its sinking ranks as the Bering Sea crab fleet's deadliest accident in more than a decade. While the cause remains a mystery, memories of the crew are inspiring fishermen to stay extra safe this winter. Last March, Unalaskans and seasonal fishermen held a memorial service at the Norwegian Rat Saloon. Starting Monday, the U.S. Coast Guard is holding two weeks of public hearings as part of its investigation into the sinking of the F/V Destination. 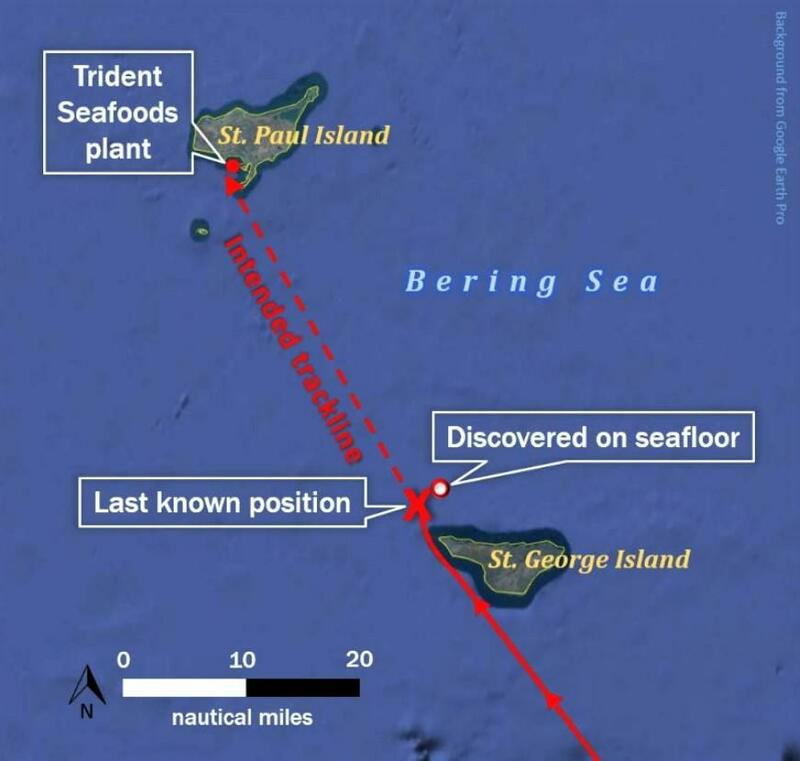 All six crew members died when the crab boat disappeared in February near St. George Island, marking the deadliest accident in more than a decade for the Bering Sea crab fleet. The vessel’s wreckage was finally located last month, but investigators are still trying to determine why the Destination sank. Three months ago, a crab boat went missing in the Bering Sea with no mayday signal. Three days after that, responders called off their unsuccessful search. Six fishermen died. A vessel was lost. All just a few miles offshore. The search for answers is still underway: What happened to the F/V Destination? It’s a Friday night, and the Norwegian Rat Saloon is packed. Wreckage from the F/V Destination has been found off St. George Island. The boat and its six crew members were fishing for snow crab when they disappeared on February 11. The National Oceanic and Atmospheric Administration (NOAA) announced this morning that two of its research vessels have found and confirmed the location of the Destination. The U.S. Coast Guard has called on its most rigorous investigators after a crabbing vessel and its six crew members went missing in the Bering Sea earlier this month. A three-day search revealed no sign of the F/V Destination, apart from a floating tangle of debris. That’s why the Coast Guard has convened the Marine Board of Investigation. After nearly three days, the U.S. Coast Guard has called off the search for six fishermen missing since Saturday, when their crabbing vessel disappeared in the Bering Sea. Coast Guard officials made the announcement Monday night, after search parties found no sign of the F/V Destination -- apart from a floating tangle of debris that included the boat’s emergency beacon, several buoys, and a life ring. Updated 2/11/17 at 4:20 p.m.
Searchers have found the emergency beacon of a commercial fishing vessel that went missing Saturday morning in the Bering Sea. U.S. Coast Guard officials say the F/V Destination activated its electronic position indicating radio beacon (EPIRB) two miles northwest of St. George Island.